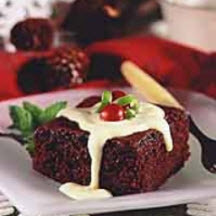 A simple and delicious chocolate cake served with a drizzle of festive eggnog sauce. Preheat oven to 350°F (175°C). Grease and flour 13 x 9 x 2-inch baking pan. Stir baking soda into buttermilk in medium bowl; set aside. Stir together cocoa and water until smooth; set aside. Beat butter, shortening and sugar in large bowl until creamy. Add eggs, vanilla and salt; beat well. Add buttermilk mixture alternately with flour to butter mixture, beating until blended. Add cocoa mixture; blend thoroughly. Pour batter into prepared pan. Bake 40 to 45 minutes or until wooden pick inserted in center comes out clean. Cool completely. Sprinkle powdered sugar over top. Serve with EGGNOG SAUCE. FOR EGGNOG SAUCE: Stir cornstarch and water in saucepan until smooth. Add milk, sugar and egg yolks. Beat with whisk until well blended. Cook over medium heat, stirring constantly, until thickened. Remove from heat. Stir in extracts. Cool completely. Sprinkle nutmeg over top. Makes about 1 3/4 cups sauce.